This was the scene at ExpoNG in Swanley, Kent, late in October 2003. Lined up facing the hall entrance were these three formidable but very small model railways. In fact, all three were created to fit in shoeboxes, by three indomitable English modellers — Chris Krupa (who started it), Chris O’Donoghue, and Richard Homewood. 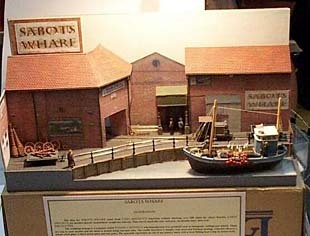 Chris’s OO9 layout (9mm gauge) reverses the design of Carl’s Imports and features a canal boat and a busy wharfside scene. A sector plate is hidden at the right rear corner. This one follows the design of Carl’s Imports very closely with the sector plate at the left rear. 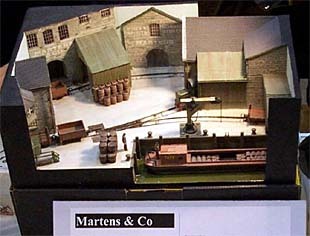 Both buildings and boat were modelled after actual English prototypes. This work-in-progress photo shows Richard’s first serious layout in something like 30 years. 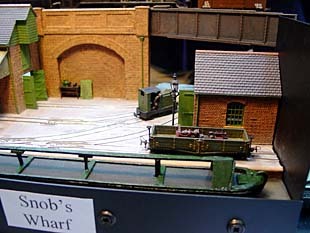 It features complex trackwork, a full-sized canal boat, and a standard-gauge locomotive overhead!